A superior second volume of tropical cumbia from Vampi Soul – and a more expansive set than the first one, too! The vast majority the the great stuff here comes from the psych and immediate post-psych years– and it has the tripped-out sounds to show for it – but those are anchored nicely, by feverish percussion and tight tropical rhythms. Beyond that are some some great wah wah guitar, trippy organs, Moog and synth grooves – for a really great sound! 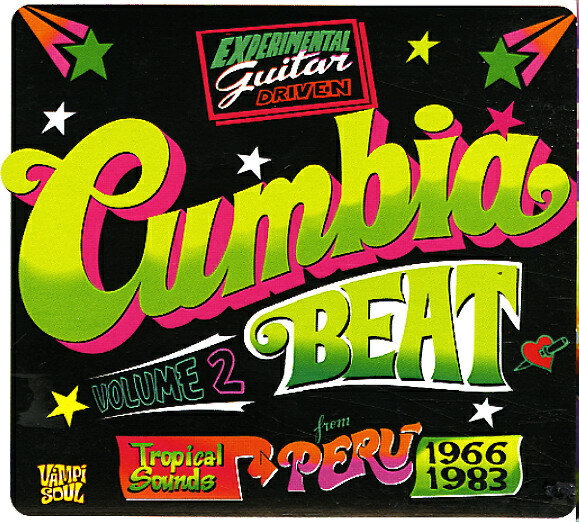 This volume is also pretty heavy with instrumentals, but there's some standout vocal tunes, too – with numbers by Los Destellos, Compay Quinto, Los Yungas, Grupo Celeste, Juaneco Y Su Combo, Los Demonios Del Mantaro, Los Ecos, Los Beta 5, Los Orientales De Paramonga and many more. Comes with a nice little booklet of photos, with notes in both Spanish and English. 34 tracks including "Mi Choza, Mi Chacra Y Mi Mujer" by Manzanita, "Boogaloo Del Perro" by Los Destellos, "Baila Flaquita Baila" by Los Ecos, "Illimana" by Los 5 Palomiullas, "Recordando A Fachin" by Juaneco Y Su Combo, "Sin Exito" by Grupo Celeste, "Selva, Selva" by Juanaco Y Su Combo, "Colegiala" by Los Ilusionistas, "El Panadero" by Los Beta 5, "Peti Pan" by Los Demonios Del Mantaro and many more. © 1996-2019, Dusty Groove, Inc.